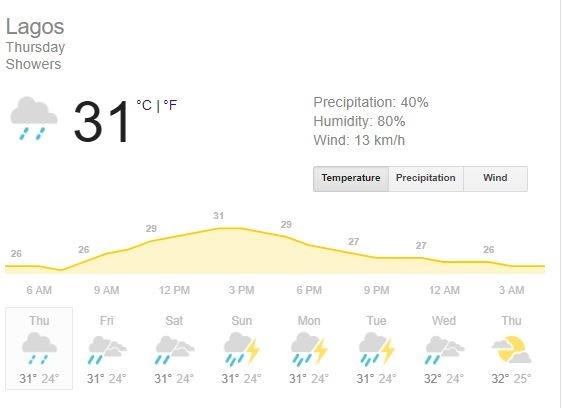 Lagos: Temperature, 26°C - 31°C. Mostly cloudy with 68% chance of rain. Abuja: Temperature, 22°C - 31°C. Partly cloudy with 52% chance of rain. Port Harcourt: Temperature, 18°C - 24°C. Thunderstorms expected with 82% chance of rain. Enugu: Temperature, 23°C - 33°C. Thunderstorms expected with 74% chance of rain. Kano: Temperature, 23°C - 38°C. Partly Cloudy with 0% chance of rain.